In his work, the German-Lebanese artist Said Baalbaki grafts, as it were, the cultural, artistic roots of his native country to contemporary discourses in his chosen homeland. He lives and works primarily in Berlin. The subject matter of his work has been largely informed by the artist’s traumatic first-hand experience of the Lebanese Civil War but also by the great beauty of his birthplace and its renowned Mount Lebanon, praised for its splendour in sources as early as the Bible. His series of works entitled Mon(t) Liban reflects, on the one hand, the dichotomy of destruction and flight but, on the other, the consummate beauty of the landscape integral to his native country. For this series and still others, he has employed the most varied of mediums including painting, graphic design, drawing and sculpture. So too do print portfolios and artist books constitute an important component of his overall oeuvre. Said Baalbaki is principally concerned with questions concerning identity—with the mechanisms of perception and constructions of knowledge, truth and authenticity, all of which are strongly influenced by the various cultures and religions. 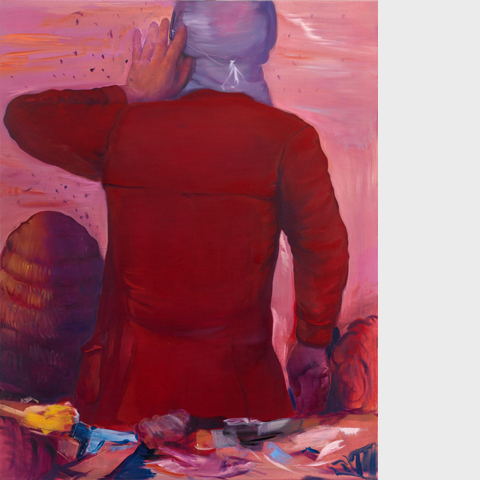 His motifs are appropriated from the immediate everyday as well as his own internal world, encompassing his memories of a childhood and youth spent during the Lebanese Civil War. The artist isolates and abstracts ordinary objects like suitcases, belts and other articles of clothing, but also pieces of hunting equipment, and works them into agglomerations of colour-planes and purling structural clusters. The individual elements retain their disparate qualities, however, and glisten through as pictorially commanding solitaires akin to symbols in an encoded language. Having thus acquired lives of their own, they persist in pointing far beyond any everyday understandings of their significance.